activeCollab time tracking is easy to setup in Hubstaff and only takes a few minutes. To begin, log into your Hubstaff account and follow the instructions as shown in Step One below. 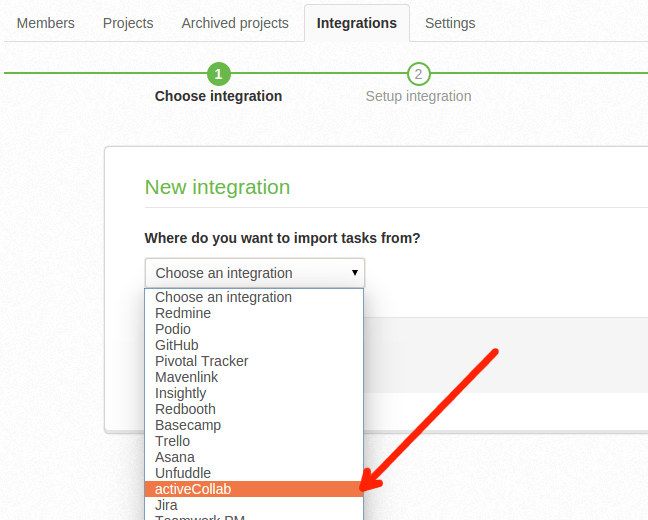 Click the button “Add integration” and a drop down menu will appear. Select activeCollab from the drop down menu and click “Next”. Next, log into your activeCollab account and obtain an Application Programming Interface (API) token. This will allow activeCollab to interact with Hubstaff. Hover the mouse over your profile picture at the bottom left of the activeCollab home screen and then click your username. 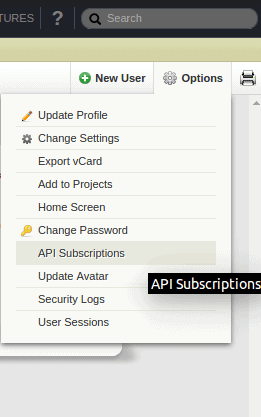 In your profile window, hover your mouse over “Options” and in the drop down menu that appears, click “API Subscriptions” as shown below. 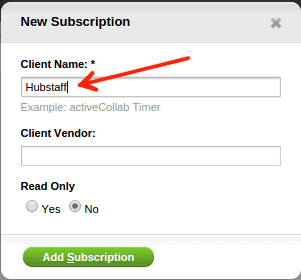 Next, click on the “New Subscription” button, enter “Hubstaff” as the Client Name, leave the other settings unchanged and click “Add Subscription”. The token is saved and you will be taken back to the API Subscription screen. Click the magnifier icon and take note of the API URL and token as shown below. Next, paste the API URL to the Site field and the Token to API token field in your Hubstaff account as shown below. 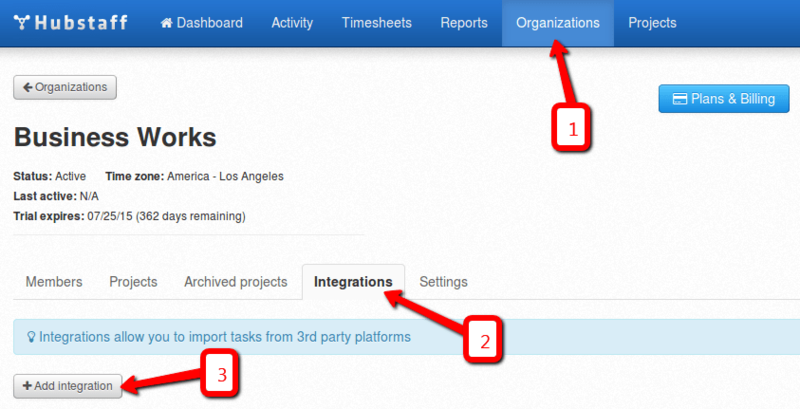 Click “Create Integration” and in the next screen, select your activeCollab account from the drop down menu, click “Save” to finish configuring integration and move on to Step 3 below. 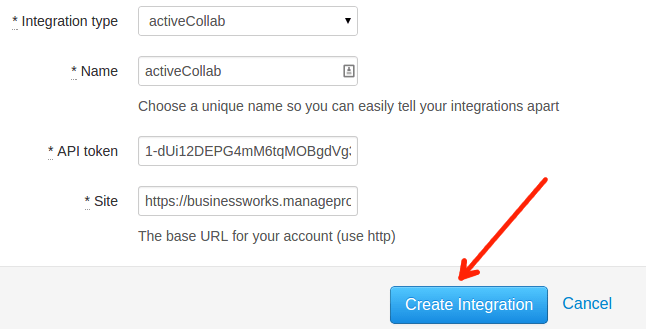 In this step, you will link your activeCollab projects and tasks to your Hubstaff account. The important thing to note here is that while you can use several project management services in Hubstaff all at the same time, you can only map one project to an external service at a time. To illustrate, in my example below, I had already mapped one of my projects, Hubstaff business, to Basecamp. I therefore cannot map this project to activeCollab. Click “Link” as shown above to link a project and a pop up similar to the one below will appear. 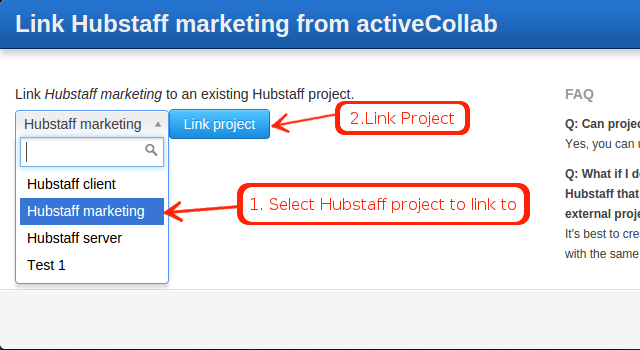 Choose a Hubstaff project to link to, click “link project” and move on to Step 4. The next step is linking your users which is very similar to linking projects. Simply click “link” against the user you want to link and then click “link user”. As with projects, users can only be linked to one project per integration. You should first invite users to Hubstaff before trying to link them so if you haven’t done so, send them invites then come back to this screen and link them. Next, each member of the team needs to update their Hubstaff application to the current beta release. This is done by restarting the Hubstaff app and checking for updates as shown below. Once tasks sync, each team member will be able to check for updates. Finally, confirm you have set up activeCollab time tracking correctly by checking your Hubstaff client to see if you can see your activeCollab tasks in the linked project. If the setup has been done correctly, the tasks should appear in the window to the right of the project list as shown in the image below. Click on the project you have mapped to see the associated tasks. And, that’s it! You have successfully integrated Hubstaff with your activeCollab account. Know more about Hubstaff's integration with activeCollab for effective time tracking.